During your first visit you will meet with our physician to determine if BMI's program is well suited to you. 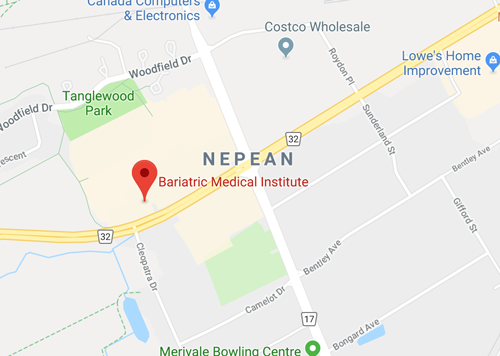 Should you feel that BMI is the place for you then you will be asked to do a series of blood tests, an electrocardiogram (ECG) and book your appointment for a full bariatric physical examination as well as set up your first one-on-one visits with our dietitian and certified fitness consultant. You will also be asked to book a 15 minute appointment to have your resting metabolic rate measured as well as undergo a body composition analysis. To ensure your safety, BMI's program will start only after completion of your physical examination and review of your bloodwork. Can I eat out while on your program? Absolutely. BMI's program is meant to teach you the means to live your lives free of constantly battling your weight. In order to do so you will learn about diet, exercise and changing your eating behaviours, but if you weren't able to live normally and go out with your friends, clearly the program would be set to fail. As well, our registered dietitian will be providing you with extensive nutritional education with which you will be well equipped to make healthy choices when out with your friends and family. Simply call us at 730-0264 (730-0BMI) and set up your first appointment. It's as easy as that. Is your program covered by OHIP? Partially in that roughly 1/3 of the program's true costs are covered by OHIP as all visits with the physician are covered. Unfortunately OHIP does not pay for visits with our dietitians, certified fitness consultants or the use of our on-site fitness facilities. Do I need a referral from my doctor to visit BMI? No, there is no need for a physician's referral however many physicians do refer their patients to us. Every patient is different. At BMI we strive for weight-losses of 1-3 pounds per week and our first goal with our patients is to have them lose 10% of their body weight. A 10% weight-loss has been shown to have significant health benefits. Once the first 10% is lost, we reset that goal and continue until you reach a weight that you are happy with. How heavy do I have to be to visit BMI? Anyone who feels they have a problem with their weight can visit BMI. Together with our physicians you will decide if BMI is well suited to your weight management problems. Does BMI uses meal replacements and will I be on an all liquid diet? No, absolutely not. At BMI we would only ever recommend you use meal replacements if you were using them to replace meals you would otherwise skip. As well, while we have meal replacements and protein supplements available they are not required as part of the program but rather are there for your convenience. Many patients complete the program without ever purchasing a single one and if you do want to use protein supplements and you have tried a product in the past that you have enjoyed, we certainly won't require that you buy those we stock instead. Your program sounds interesting, but I really don't want to do the exercise component. Is there an option without exercise? No. As detailed in our science and medicine section on exercise, exercise is an absolutely essential component of a healthy weight lifestyle. However, what our certified fitness consultants will strive to do for you is find you fitness activities that you enjoy so that once you have completed the on-site fitness component of our program, you will be able to continue your daily fitness in a manner that suits you. What type of diet do you use at BMI? What we don't use at BMI is a one-size fits all diet. Every client's diet will be individualized based on their lifestyles, resting metabolic rates, activity levels, co-existing medical conditions and their dietary likes and dislikes. With rare exceptions we will not be using low-calorie diets or very-low calories diets unless there is a pressing medical need for speedy weight loss. No. At BMI we realize that if you're hungry, there is no way that you will be able to maintain your weight once you have completed our program. If you are hungry while on our program, our physician and our dietitian will make adjustments to your diet to ensure that you avoid hunger. My friend goes to another medically supervised weight loss program and she receives injections for weight loss. Does BMI give injections? Absolutely not. There has never been any scientific evidence to suggest that injections of B vitamins improve weight loss or accelerate metabolism. BMI prides itself on being a medically responsible weight loss centre and will never offer any services or products that have not been proven scientifically to help its clients. We will however be recommending that all of our clients take a quality multi-vitamin and depending on blood work results may recommend other vitamin supplementation. Does BMI use weight-loss medications in its program? Very rarely. Our physicians believe that over 95% of our clients will be able to succeed on our program without the help of an appetite suppressant medication. Our physicians may however want to make changes to your existing medications. If you are one of those very rare individuals who truly require medical assistance with weight-loss, our physicians will be well equipped to write the appropriate prescriptions.